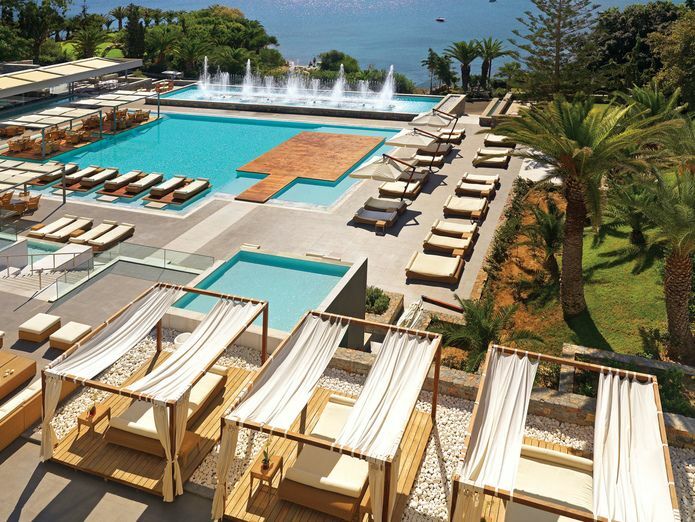 Five-Star award winning Out of the Blue Capsis Elite Resort combines luxurious family facilities, a world-class spa with true Cretan hospitality. The unique private island location offers opportunities for a family holiday, a romantic couples break, luxury time out with friends, a dream wedding or corporate event. Recently, I had the chance to visit this beach resort. Read on about my experience in May 2017. 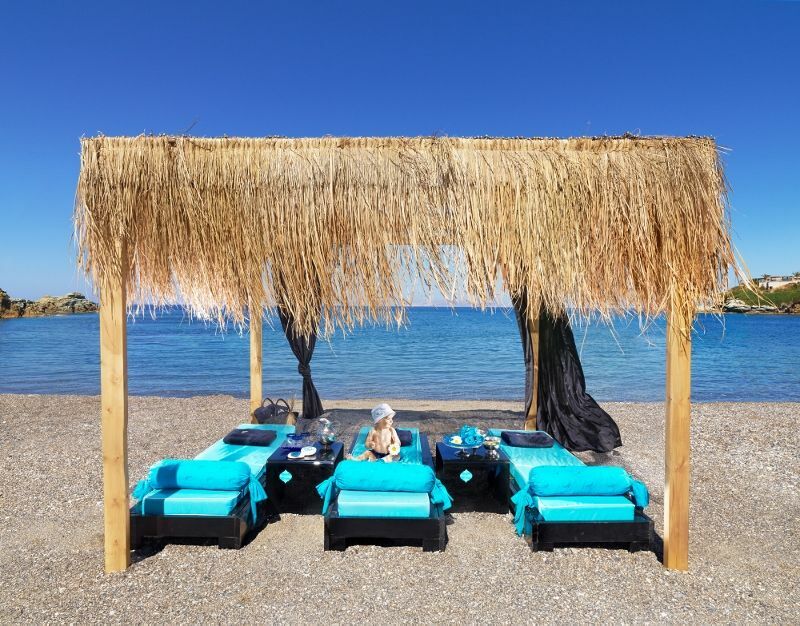 Out of the Blue Capsis Exclusive Resort is build on a private peninsula in the traditional fishing village of Agia Pelagia. Covered with lush botanical gardens, tall (exotic) trees and colorful flowers, the resort offers dazzling views from everywhere around over the Aegean Sea. 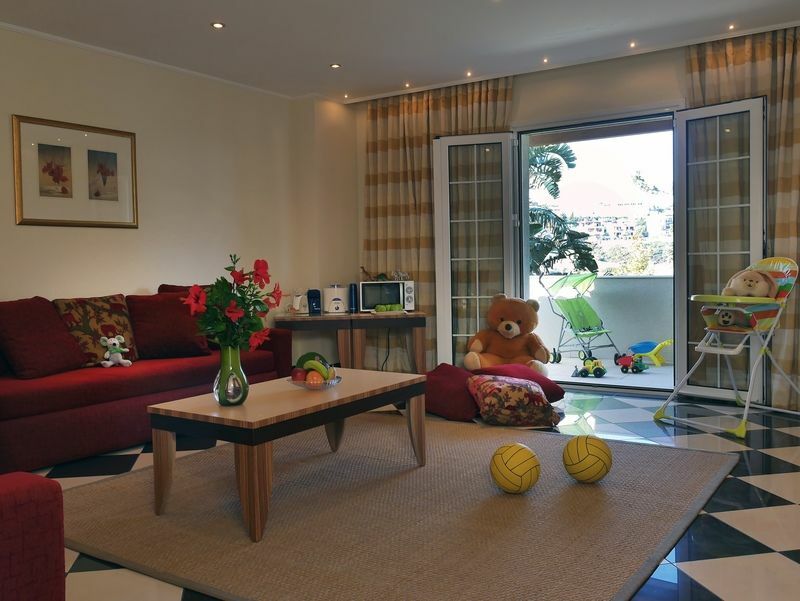 The resort is a 20-minute drive away from the city of Heraklion and the International Airport of Heraklion. I travelled with my friend Chrysoula from Travel Passionate from Athens airport to Heraklion, a flight no longer than 40 minutes. This makes the resort a perfect destination for a weekend escape or business event for the Athenians as well as longer holidays. The Out of the Blue Capsis Elite Resort offers a concept of different hotels and a large array of unique villas, (family) bungalows and private pool villas. Each with their own character and style. In fact, there are 3 collections (Classic, Lifestyle and Exclusive) with different hotel philosophies. These hotels are spread out over the large property and separated by ponds, colorful gardens and waterfalls. Some have indoor swimming pools too. It took me a while to undertand how many different room types and private villa’s are present at Out of the Blue. The setting on the peninsula is so spacious and private that I never felt that I was in a large resort. The most remote villas make you feel as if you are visiting a country-house on a private island. The hotels offers a total of 465 rooms. There are also 13 meeting rooms with a capacity of 900 persons. Me and Chrysoula visited a lot of the accommodations and have first hand experience from the interior and exterior. We were very impressed with the design used, the art works, the fabrics and the unique character of each villa. I will not describe each room but do take a look here to get a better understanding of the different types of accommodation. 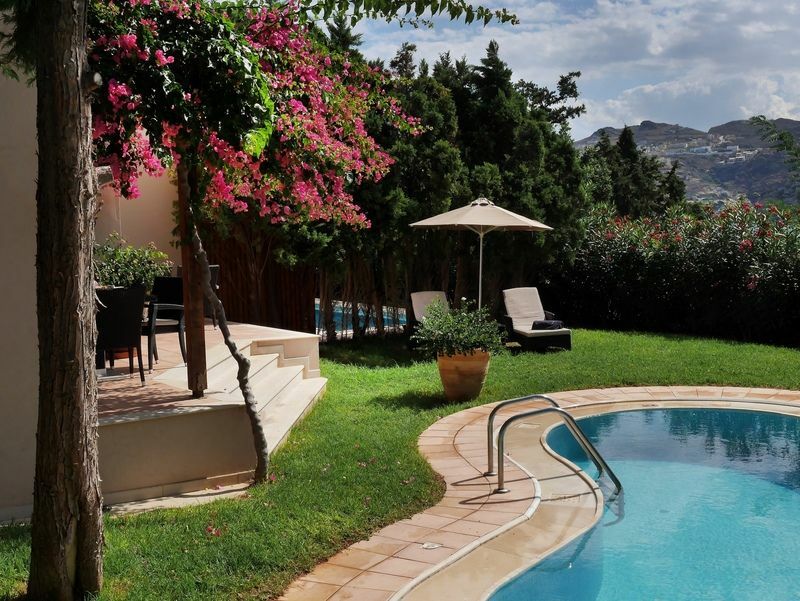 The Classic Collection at the Out of the Blue Capsis Elite Resort offers rooms, bungalows and maisonettes very suitable for families and couples. They come in different sizes and styles, most with marble bathrooms and with the largest accommodation sleeping 4 adults and two children. For couples I would recommend the Presidential and Royal suites with jet shower and jacuzzi bathtub. The rooms are located in between a labyrinth of gardens – including a cactus garden – and near the the private beaches, the water park and the entertainment park. Some bungalows are directly connected to the family swimming pools, others are overlooking the gardens. On the website you can find the exact size, number of beds and location of each room. 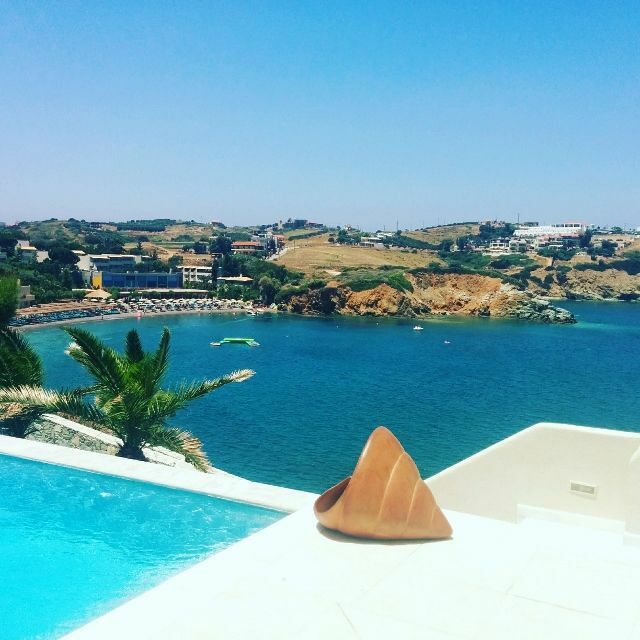 The Lifestyle Collection is the second hotel concept in Out of the Blue Capsis Elite Resort. Its style is very different from the Classic Collection. Modern, minimal, arty and hip are the words that I would use to describe the rooms. Ideal for families and couples This hotel is member of ‘Lifestyle Preferred Hotels & Resorts’. 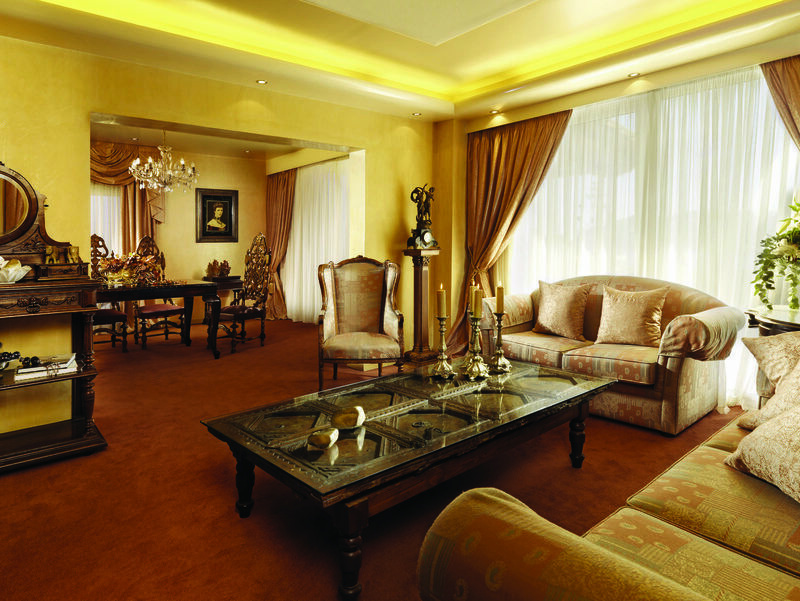 There are large 1,2 and 3 bedroom suites some with sitting – or dining area. The largest room sleeps up to 8 people (6 adults + 2 children). 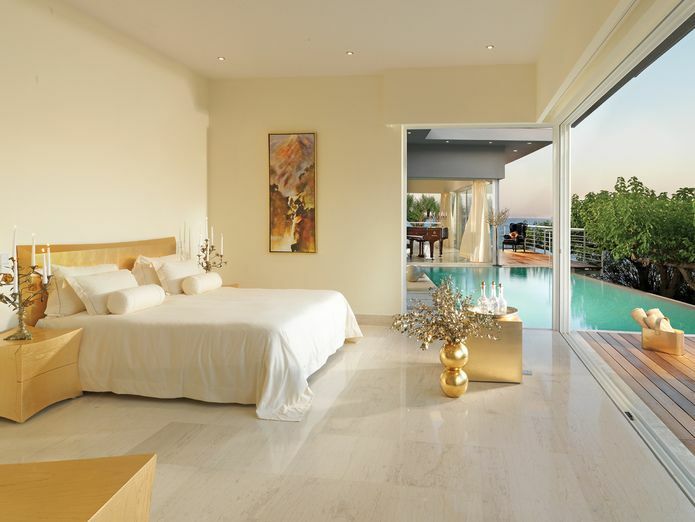 Connecting two suites, this large rooms offers sea view, modern high-tech design and en suite shower room. Breakfast is served at the hotels private area. The Lifestyle collection is centrally located, in the middle of the resort around a beautiful swimming pool. Find all the specifics of the Lifestyle collection here. The Exclusive Collection is a privately gated area with its own private breakfast restaurant. It is a collection of luxury suites with private jacuzzi, sharing pool or private pool, private pool villas and pool maisonettes. Some with indoor pools too. The top suite is the stunning Black Pearl Residence. The villa has amazing vistas over the Aegean Sea, a large living area with piano, fireplace, home cinema, private gym, indoor and outdoor pools and much more. The Exclusive Collection comes with exclusive privileges such as private gazebos on the beach or on the deck and complimentary access to the spa and gym. Take a look at the beautiful villas and suites here and don’t forget to check click on the Love Story Villa and the Emerald Villa. Me and Chrysoula stayed in a Luxury Junior Suite with Private Jacuzzi. 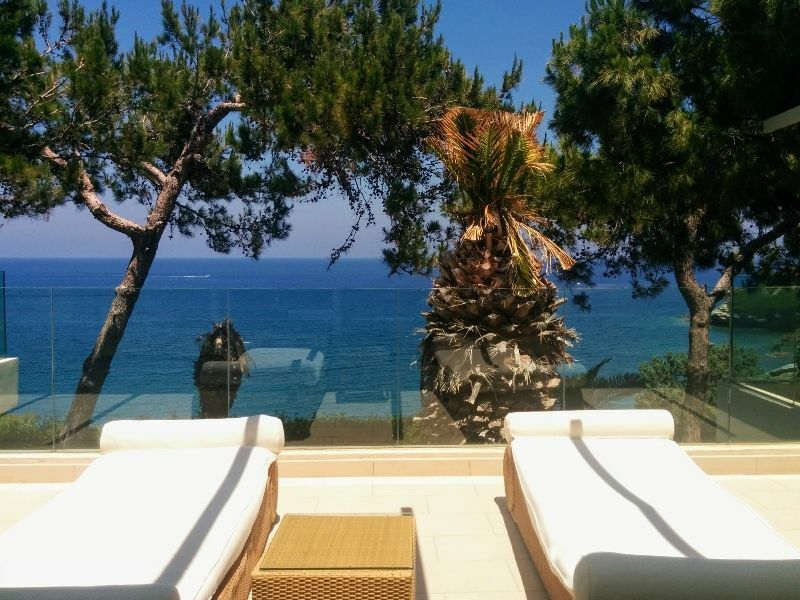 Chrysoula’s suite was located on a corner offering beautiful views over the sea and gardens. My terrace was overlooking the picturesque village of Agia Pelagia offering happy lights and a little buzz in the evening. Our rooms had the option to be connected. My 48m2 room featured a queen size bed, a very spacious bathroom with jacuzzi bathtub and separate shower, a jacuzzi on my terrace, sitting area, Bulgari cosmetics, beach and pool towels, an enormous flat screen TV with dvd, cd, coffee and tea facilities and more. I felt instantly relaxed and at home by the classic decor of the elegant Italian Boffi collection furniture. The style was classic modern. My room was very private, cool and quiet. I loved the large minimal architecture of my terrace with its jacuzzi and lounge chairs. I felt often that I did not want to leave the room and just sit there. Enjoying the jacuzzi on my terrace. Our airport taxi driver drove us through the security Gate to the Exclusive Collection and dropped us off outside of our private Junior Suites. We received a warm welcome by the hotel staff and were offered a refreshing towel and cold drinks upon arrival. A welcome fruit basket and wines, as well as traditional Greek sweets and Cretan liquor were waiting for us in our room. Fresh new sweets were left to our room each day. 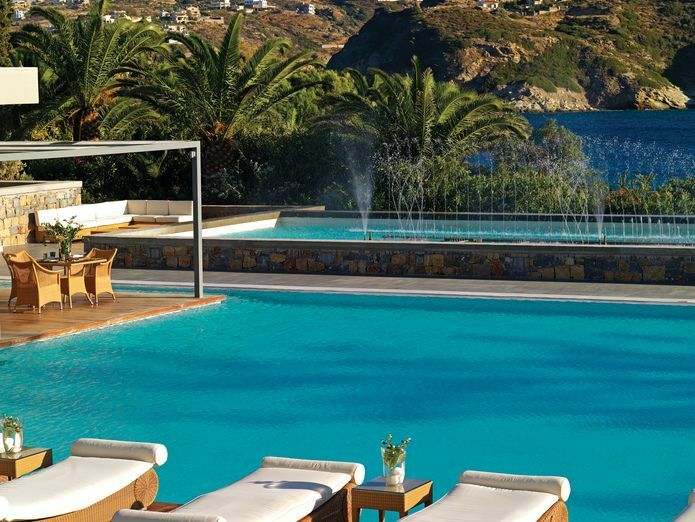 Out of the Blue Capsis Exclusive Resort offers top-level services, such as a helipad and private pier. The Capsis Euphoria Rejuvenating Spa presents a combination of the Dukan Diet, anti-ageing treatments, customized nutrition, aesthetic services and psychological support. Read about my spa experience here. A picturesque chapel can be found on the grounds. Tailor made weddings and honeymoon packages are part of the services too. There is a Fit4Life Fitness Lounge, a mini-football field, an archery area, a sand volleyball court, tennis courts, a basketball court and outdoor areas for yoga. 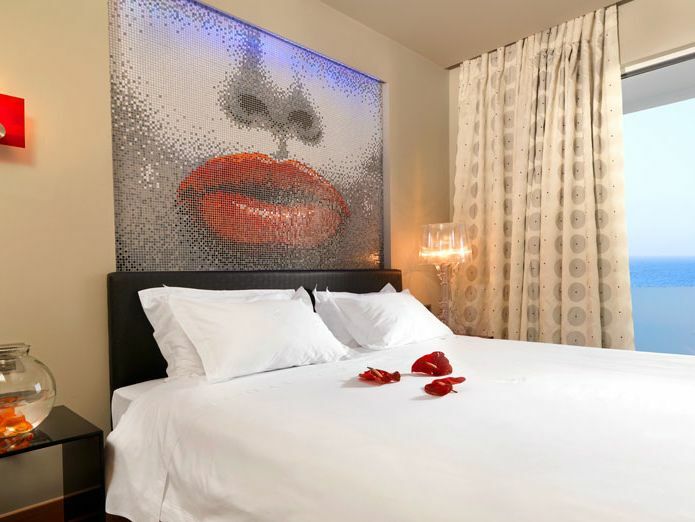 A boutique, minimarket and 24/7 room service make sure that you have everything you need. Out of the Blue Capsis Elite Resort hosts many swimming pools including an indoor pool at the Capsis Euphoria Rejuvenating Spa at the Exclusive Collection Hotel. This spa pool can be used by guests of the Exclusive Collection as well residents of the presidential suites of the Classic Collection or by people that have made reservations for spa treatments. 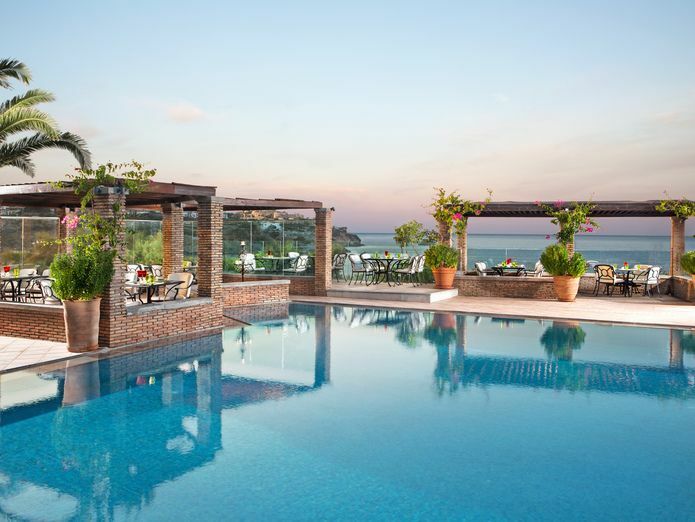 Guests of the Classic Collection can use the Ruby Red Regal Hotel Outdoor pool overlooking the sea and surrounded by green gardens. Another pool overlooking the sea is the Safran Outdoor pool seen above. The H20 outdoor pool at the Lifestyle collection hotel is the largest pool of the resort. It is trendy and hip and offers amazing views and stylish sunbeds and internal decks. For families and children are several large play pools available. One of my favourites is the Minoan Palace outdoor pool at the Minoan Amusement Club. 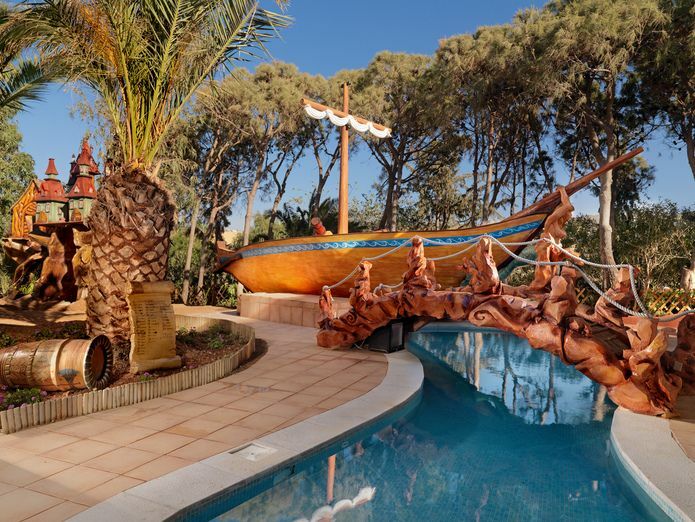 The pool featured a replica of the Ulysses ancient trireme boat. But there is more for the kids. 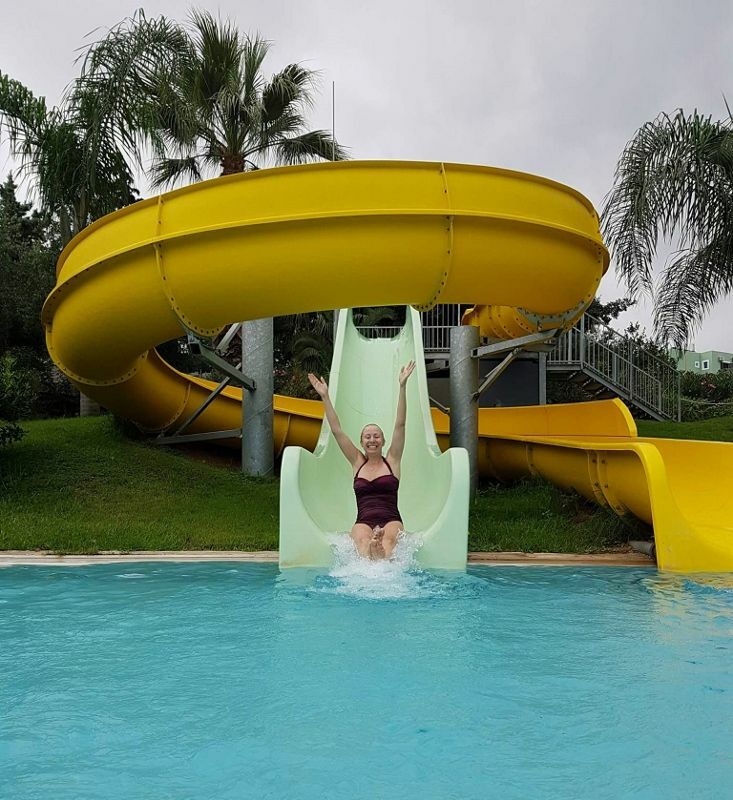 Another fun pool is the brand new kids pool called Laguna Rossa featuring some very safe shallow baby pools, small slides and large grass play areas. Lifeguards are present here. Do you like watergames as much as I do? My best pool at Out of the Blue Capsis Elite Resort was the Azure Outdoor Pool. The family bungalows are located around this tropical pool with large shade areas and beautiful pergolas with flowers and hidden corners. Walk out of your family room and jump into a pool adventure! There are 2 new exciting waterslides here and a crazy river offering a magical route through slippery slopes and steep turns. Feeling like a kid again trying the waterslides at the Azure Outdoor Pool. The Out of the Blue Capsis Elite Resort pools are open from 10 am until 6pm. Sun beds, towels and umbrellas are free of charge available. Not in the mood for swimming pools? The resort has its own very large private beach with sand and small pebbles. This ‘Cladissos’ beach is divided into 2 sections; on for Classic Collection guests and one for the Exclusive Collection with complimentary sunbeds, umbrellas or gazebos. There is a watersports center and PADI scuba diving school. I loved the floating water games in front of the beach. 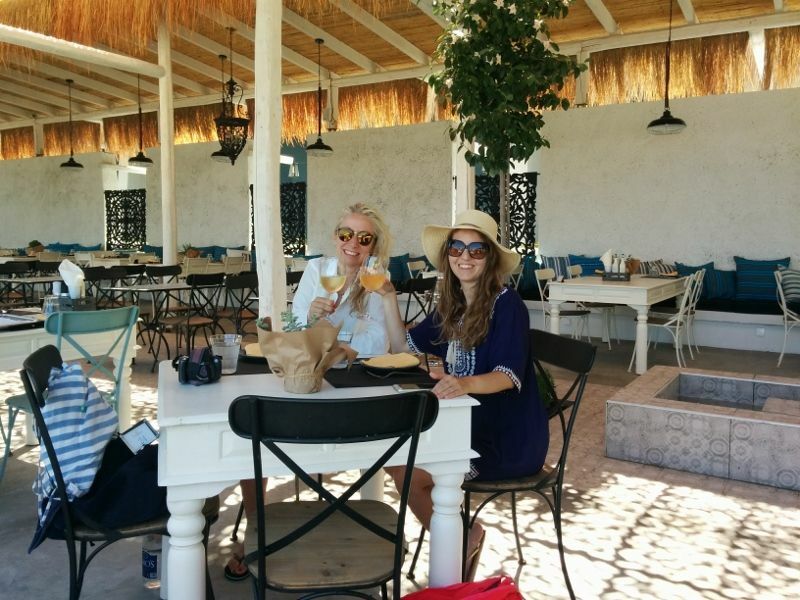 We sat in a private gazebo with cushioned sun loungers, towels and excellent private service. Although the hotel was fully booked during our stay, the beach never felt crowded. Due to its size, guests are spread out and the mood at the beach is calm and quiet. I also loved the Blue Diva wooden deck (for guests of the Exclusive collection) with its gazebos overlooking the ocean. 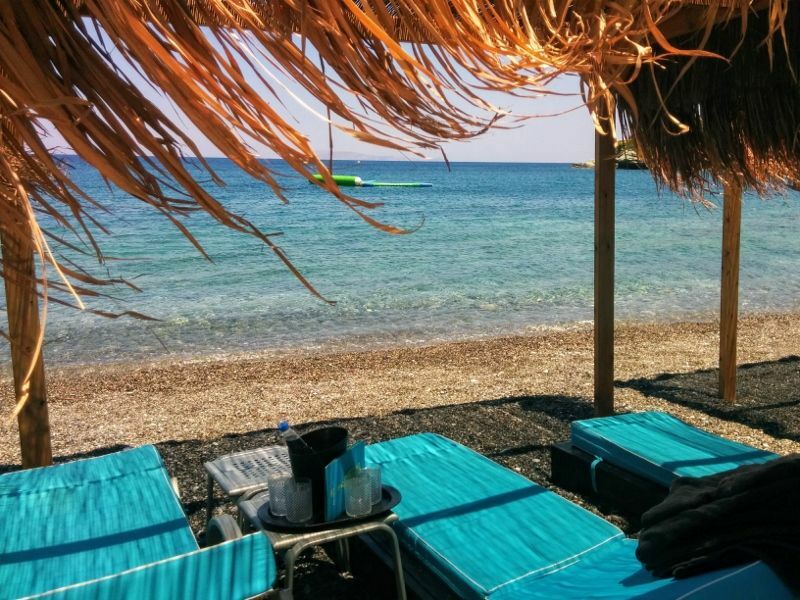 A second beach is the public beach of Agia Pelagia located in front of the resort. 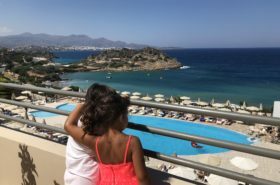 This beach is actually one of the most beautiful and family friendly beaches in Crete. It has crystal clear turquoise calm waters and white fine sand. Ideal for small children. The resort offers sun beds, towels and umbrellas for guests free of charge at the public beach. I must admit, I have become a big fan of the Out of the Blue Capsis Elite Resort family program. I believe that the resort offers top notch family facilities in a calm, original and hospitable setting. Family friendliness at Capsis Elite Resort means an exclusive Baby Concept, unique activities for young children and a special program for teens. In-suite baby facilities are changing tables, baby seats, microwaves, cots, bottle warmers, strollers, food steamers, kettles, blenders, lunch thermo pots, water thermo pots, bottles sterilizer, bed carrier. Need that much wanted rest? A creche hosts the little ones (from 6 months until 3 years old) in a beautifully designed nursery. There is a separate rest area for the little ones where they can nap. They are being supervised by a professional nursery staff. The hotel can also arrange a babysitter for you. I found the nursery spacious, clean and safe. The best family feature of Out of the Blue Capsis Elite Resort is the Minoan Amusement Club, open for children from 4 – 11 years old. The park is inspired by the famous Cretan ancient Minoan Palace of Knossos and features a fairy-land and a historical playpark of 4.000 m2. 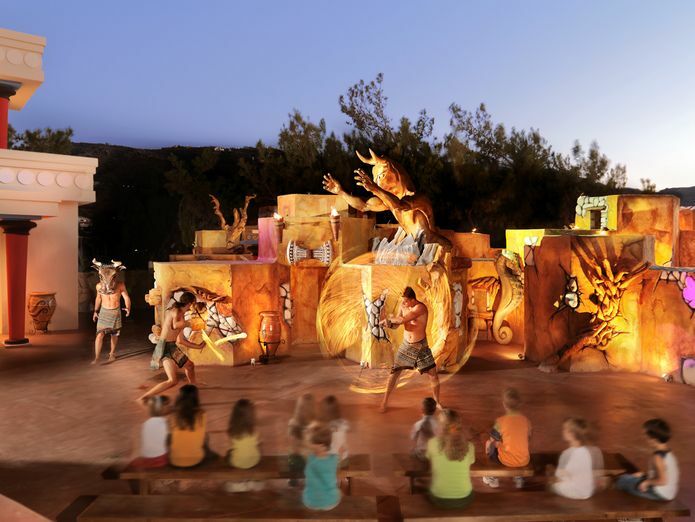 The Minoan Park introduces kids to the world of the Minoans and Greek Mythology and makes them travel back in time. 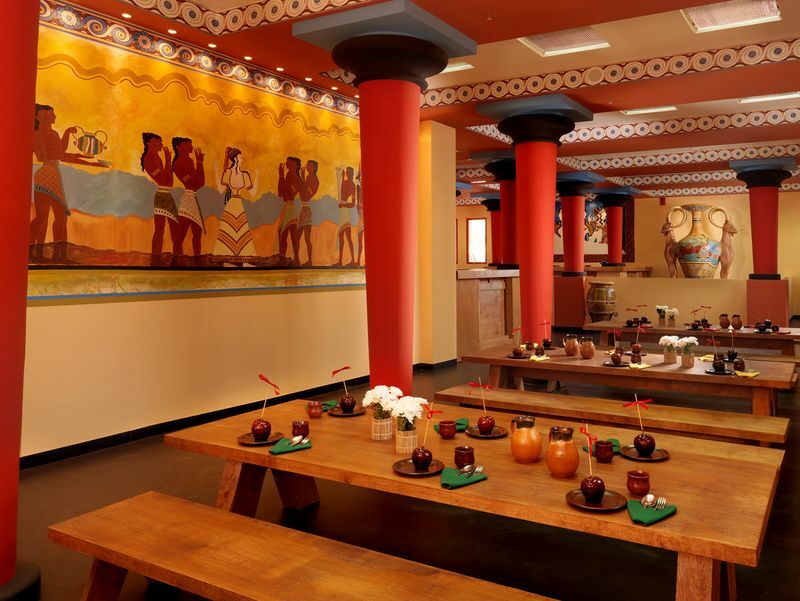 It consists of two parts: a Minoan Palace for indoor activities and an outdoor play area. Inside the Minoan Palace is the pottery room the above mentioned nursery and the sleep area. Beds and baby cots are available for all the different ages. The Palace also hosts a video and interactive games room and an indoor theater. Outside is a Minoan labyrinth with more than 20 communicating rooms as well as archaeologist games such as archaeological treasure hunting and a puzzle game. The earlier mentioned Minoan pool, trampolines, tree houses, a wobbly bridge, a climbing wall and more. The outdoor theater is for a daily evening show and a mini disco. There are also regular puppet shows and other performances organized. The children can also eat during their stay in the Minoan Amusement Park. An indoor restaurant and bar has specifically created for the little ones. What an amazing place, I am definitely planning on bringing my children one day! The Children facilities are open from Monday to Saturday from 10am to 18pm and operate from April until October. Capsis Elite Resort is truly a family destination because teens have not been forgotten. The Teenagers Club welcomes kids from 11 until 17 years old and engages them in a large variety of activities such as jogging around the gardens, swimming, football, cooking lessons, tennis, pastry lessons, fashion shows, sports – and chess competitions. Camping at the hotel gardens, bbqs, disco nights and beach parties are also organized. Last but not least; teens (as well as adults) will love the escape rooms. 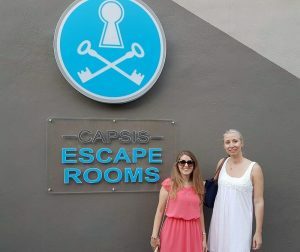 Did you know that Out of the Blue Capsis Elite Resort is the first hotel in Greece with Escape Rooms?! There are 3 brand new thematic Escape Rooms at Out of the Blue Capsis Elite Resort. The ‘circus’ escape room is suitable for children over 10 years old. This is the escape room that me and my friend tried out. It was the first time that I was ever in an Escape Room and I much enjoyed it! It was great to challenge my brain again after sun soaking at the beach all day. We had great fun! Besides the many activities inside the resort, there is plenty to do outside as well. The resort staff can suggest and to arrange a wide variety of tours and other activities: Near the resort there are options such as hiking, mountain bike riding, sailing, bowling, horseback riding, go-carts, rock climbing, bungee-jumping, paragliding or play golf. 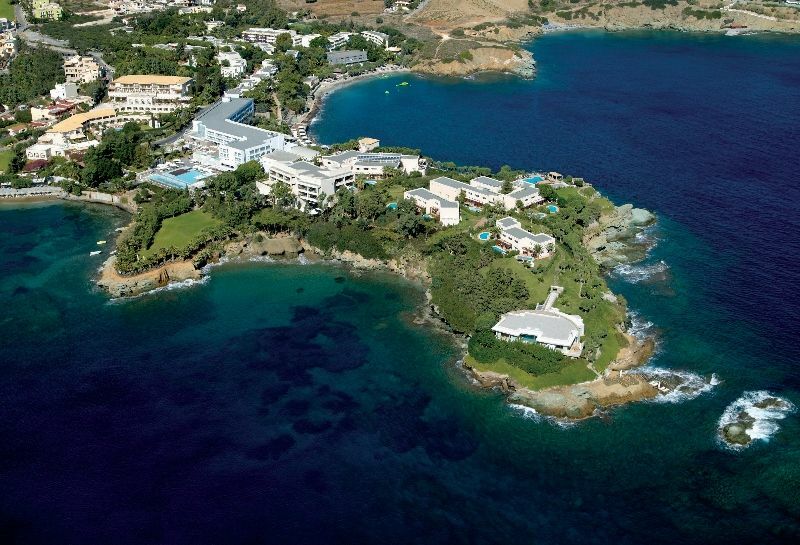 Out of the Blue Capsis Elite Resort is also perfectly located to discover the rest of Crete. If you want to go to the world famous Minoan Palace in Knossos or you decide to visit the historic towns of Chania and Rethymnon or the Gorge of Samaria, within an hour or two any destination on the island can be covered with Agia Pelagia as a starting point. Food lovers will be very happy at Out of the Blue Capsis Elite Resort. The quality and food options are excellent. The resort has 10 restaurants, 4 of them used only for private events. There are 2 buffet restaurants (Red Pepper Mediterranean Restaurant and the adults-only Green Pepper). Me and Chrysoula tried 4 a la carte restaurants. 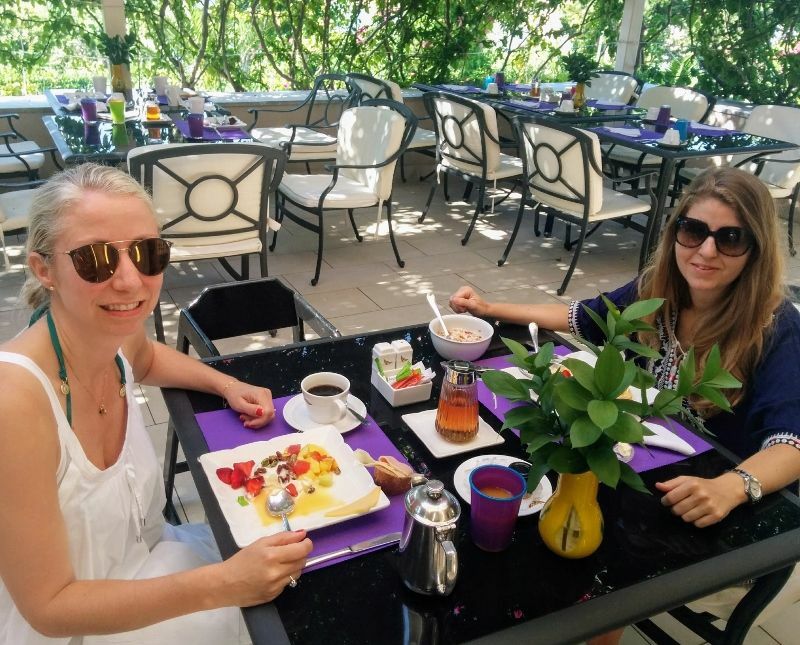 Our days started with breakfast at the Precieux Gourmet Restaurant at the Exclusive Collection Hotel. We sat outside at a pleasant veranda covered by bougainvillea. The inside interior was classy with lots of daylight and beautiful art works. Breakfast was a combination of Greek and international gastronomic tastes. The service and hospitality of the staff in the breakfast area was impeccable. Many hot and cold breakfast choices as well as a section dedicated to the detox/diet method of the Euphoria Rejuvenating Spa. Our crepes and omelets freshly made by the chef. It is worth mentioning that Capsis resort grows its own organic fruits, herbs, vegetables and olives. The best restaurant in my opinion is the H20 Aqua Fusion Restaurant. 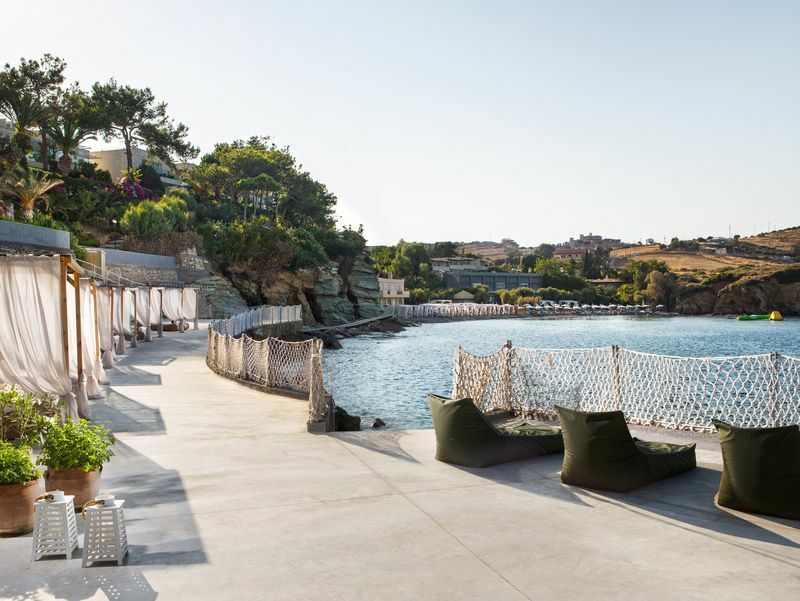 It is located along the Crystal pool of the Lifestyle hotel overlooking the Agia Pelagia Bay serving a fusion cuisine with Asian specialities. Our second dinner was at the Safran Pool restaurant, an Italian restaurant offering a unique cliff setting with spectacular sea views. It is a romantic restaurants and has been awarded a gourmet prize, by the Greek newspaper Elefterotypia for its creative cuisine. An example of this creativity was our pizza with black dough, colored by squid ink. We also tried the fresh mushroom ravioli, gnocchi and tiramisu served in a cappuccino mug. 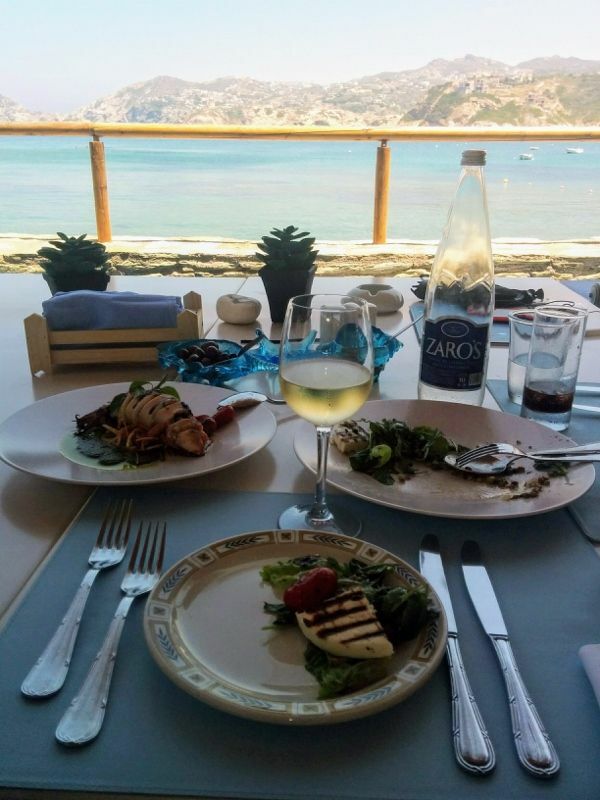 For lunch we tried the Seasalt and Rosemary Restaurant next to the public beach of Agia Pelagia. I loved the casual atmosphere of this traditional Greek and Cretan restaurant. Lots of flowerpots and herbs at the entrance, reminding me of the country side of the island, pine trees, olive trees and rosemary bushes creating a very picturesque atmosphere. It was probably my favourite restaurant because of its decor. Think of that Greek island feeling; blue sea, a breeze, a glass of cold white wine and a healthy mediterranean lunch with mezze of olives and breadsticks, salads and boiled vegetables. Pick out your fresh fish or seafood directly from the fridge in front of the kitchen. My best dish: beet root salad with goat cheese. More mouthwatering dishes were served to us during our second lunch at the Amarando Beach Bar & Restaurant located on Cladissos private beach. The Amarando is a new grill restaurant on the beach with an open kitchen and BBQ. It serves the famous ‘antikristo’, which is meat (chicken, lamp or pork) cooked on a gril around the fire. I had grilled fish with quinoa and Chrysoula tried the juicy grilled chicken freshly cut salted potatoes. We took a peek in the Green Pepper Restaurant but did not dine there. 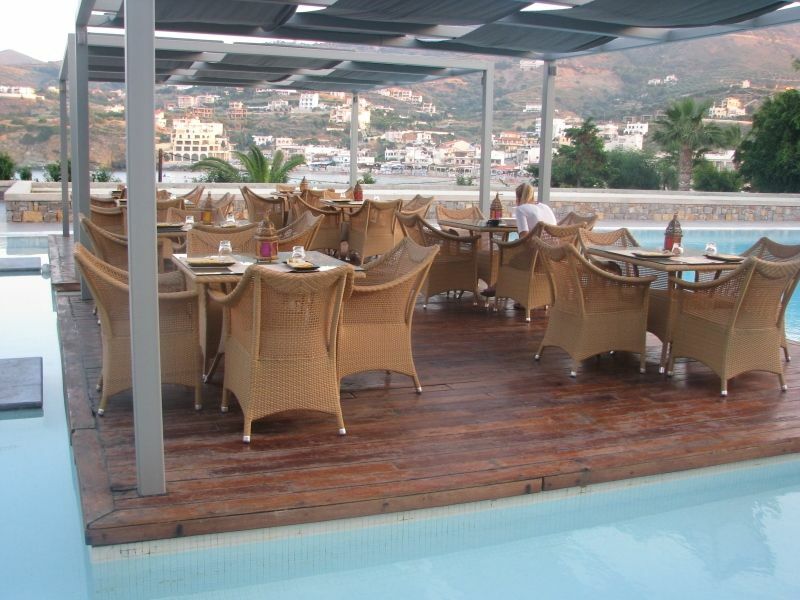 This buffet restaurant is located on a large elevated terrace offering panoramic sea views. It has a botanical indoor garden with exotic flowers and plants and the glass roof brings natural light inside. It is an romantic adult only restaurant. 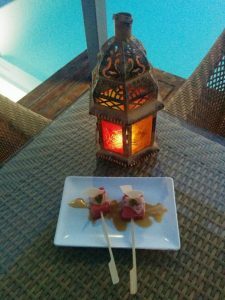 The resort offers the so called ‘Dine Around’; a program that gives you the opportunity to choose from a selection of dishes from the a la carte menu in any of the a la carte restaurants for a fixed price package. For the guests of the Lifestyle Collection, this program is included in the room rate for adults, while for the guests staying in the other hotels, this program is available on request basis. A total of 6 (pool) bars are available at the resort, each with their own unique style. The cosmopolitan Ikaros Lobby has a piano bar and peaceful gardens. The H20 Aqua Fusion Bar serves great cocktails. The Amarando Beach bar is good for the day time and the atmosphere of the Dazzle Bar is great for the evening. 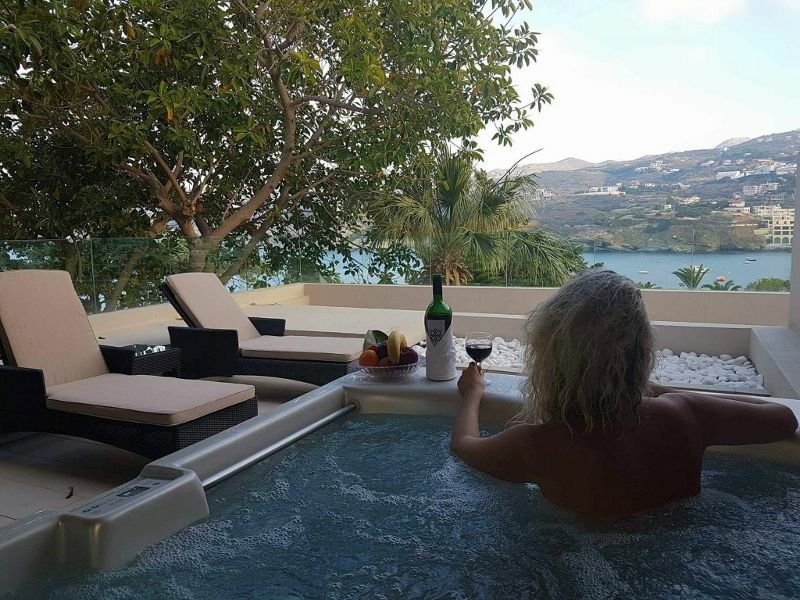 Out of the Blue, Capsis Elite Resort has been often awarded. Most recently, in 2016 the resort has been recognized as one of the leading luxury resorts in Greece, with the silver award in the category “Best Luxury resort in Greece” at the Greek Tourism Awards. An award that identifies and rewards its innovation aspects and its excellence in service and environment. In 2017, the resort received the Silver Award for the “Facilities Excellence or Innovation” category at Greek Tourism Awards. 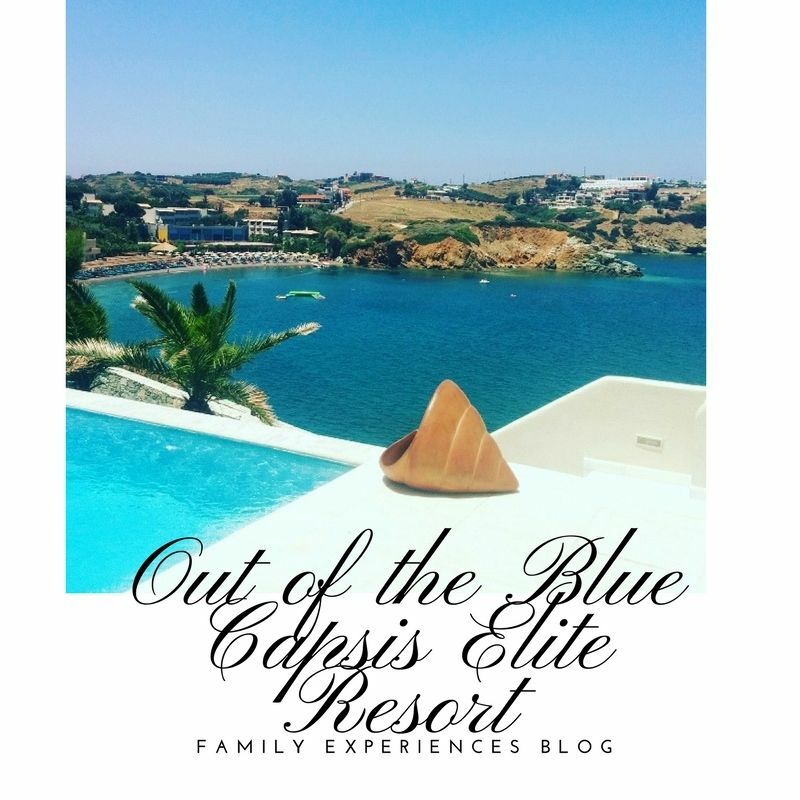 My experience during our stay in the Out of the Blue Capsis Elite Resort was excellent and well above expectations. I would love to come back for a spa or detox weekend with my girlfriends or for a longer family vacation. The resort is a feel good luxury beach resort serving delicious local and international cuisine, warm hospitality at an absolute unique location offering the best of the Greek island. It combines luxury and relaxation for parents as well as quality activities for children thus creating the perfect experience for every member of the family. The resort is unique, innovative and original in all its services. Thank you Out of the Blue Capsis Elite Resort for inviting us. 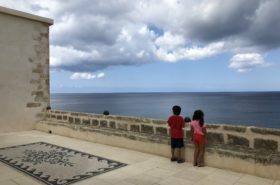 Planning a family luxury trip? Pin this post for later! I travelled with my friend Chrysoula from Travel Passionate. Her experience can be found here.